The Comfort Hotel Stavanger is located right in the city centre, just 5 minutes from the train and bus station, and even closer to the ferry terminal. So, you will be ideally situated to explore Stavanger on foot. The Comfort Hotel Stavanger boasts one of the best locations in Stavanger. The city's restaurants, bars, shops and harbour are all within easy walking distance. And guests can enjoy the convenience of being just 400m from buses, trains and ferries, as well as only 20 minutes from the airport. The wonderful Old Town, with its stunning 18th and 19th century buildings, is also just a short walk away. We have 90 hotel rooms. Choose between smart and compact single rooms, bright double rooms or spacious superior or deluxe rooms. It's not just the location that means that you can really enjoy Stavanger when you stay with us. Discover the city's nightlife and then sleep for as long as you want on Sundays. You don't need to leave your room until 6pm on Sundays (we promise!) and breakfast is served until 12 noon. We simply make it a bit easier for you to enjoy everything the city has to offer. Read more about Stavanger here. Please note that there are steps and uneven levels at the entrance to the hotel and in the breakfast room. In these locations there are only stairs and no lifts. There are lifts to the other floors. 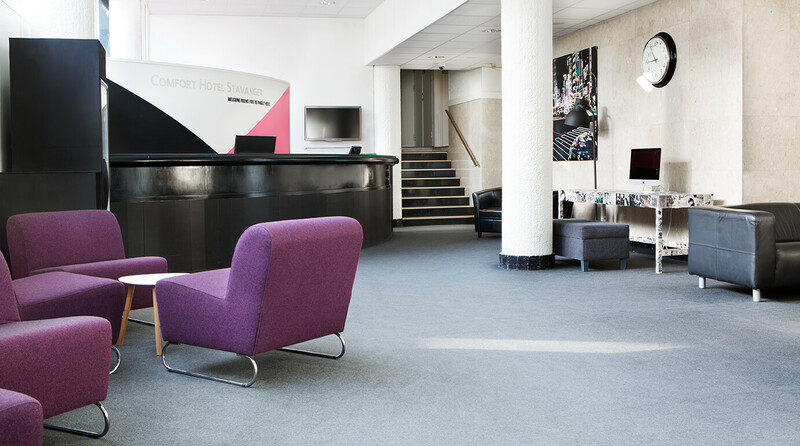 Comfort Hotel Stavanger is cash-free, which ensures added security for our guests and visitors. More information about this can be found under FAQs. Welcome to the Comfort Hotel Stavanger!